You are about to settle down for the night when all of the sudden, you find out that more than 1000 units have been taken off the production line because of a suspected product contamination. Your employees don’t have time to go through every unit to determine where the contaminant might be—but we do! 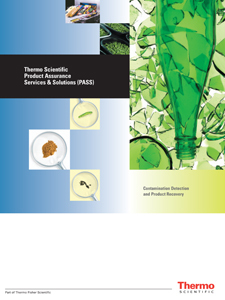 Through the Thermo Scientific Product Assurance Services & Solutions (PASS) program, we can thoroughly test every suspected product for contaminants so that you can continue producing products that your consumers rely on! We will provide you with a fast response and quality assured method by using the most advanced, non-destructive inspection techniques for maximum product recovery. Little things like contaminants can add up to be a big problem. Let us test and recover your products so you can sleep a littler better at night! Benefiting from more than 20 years experience as a market leader in the industry, we have been setting the standard for others to follow in the field of contaminant detection and product recovery. The Thermo Scientific PASS program has been fully certified in ISO 9001 since 1999 making the service the first product recovery service to achieve such high standards. This, along with detailed inspection procedures and reporting for full traceability, has led to a number of government and corporate certifications and approvals allowing us to perform under even the strictest conditions.